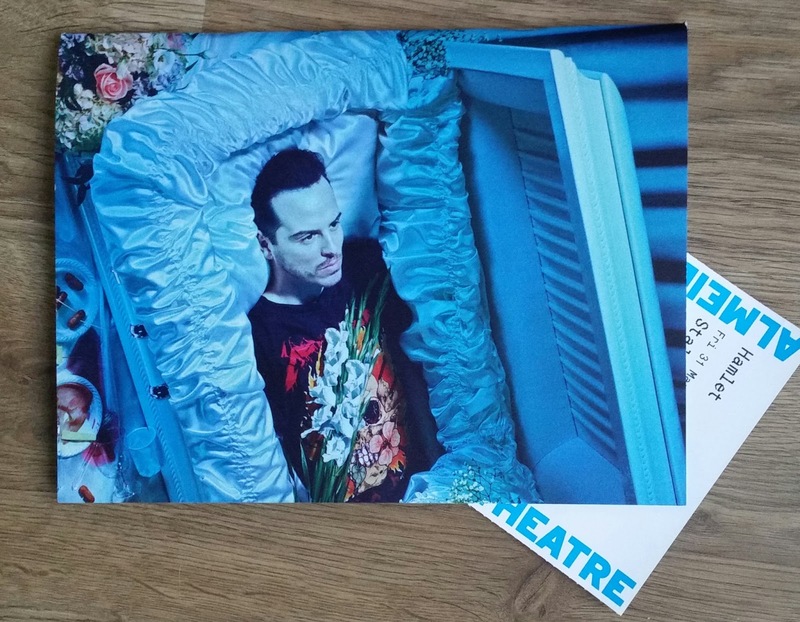 I can’t tell you how much I have wanted to watch Andrew Scott on stage. His performances as Moriarty in the BBC’s Sherlock left me dumbfounded. He played the character just the ride side of ‘geniustic’ madness, making it a character to be feared, not ridiculed, so I thought this would lend itself well to the character of Hamlet, a character that has often been ‘over performed’. This is Hamlet stripped back. The Almeida is a small and intimate space where we can be left alone with a man and his thoughts. From the start, Scott shows we are going to see a different side to Hamlet, a softer, more considered man, who as he wrestles with his thoughts and tries to put his demons to bed, becomes more and more disturbed. This modern day Hamlet, dressed in black, is emotionally charged. He’s a young man who hears of his father’s death, and within a short period bears witness to the marriage of his uncle and mother. Where is the grief? Where is the period of mourning? Did his mother not love his father? And what of the uncle? Has he always desired his mother? These and many more questions abound Hamlets frail mental state, and Scott interweaves the tides of emotion from anger and frustration, to tears and grief. Just as you are accustomed to one thought process, Scott twists and turns to another like a man possessed, giving the text a new tempo. It is interesting to see just how well this piece plays out as a more conventional piece of theatre. It utilises CCTV cameras and news reels to bring the audience closer to understanding the political conflicts, as well as the family turmoil. It becomes clearer, to me anyway, that this is a play that not only represents a young man who resents his uncle for capturing his mother’s heart; but a play that shows the dysfunctionality of the family system whatever era we’re in. They are people trying to live, day by day, harbouring grief and feelings that they don’t altogether understand; their public faces are put on, but behind closed doors they allow the angst and pain to flow. Scott speaks softly, as though trying out his lines for the first time. It’s as though he has a stream of consciousness that he is trying to put together, to make sense of, which gives his character an almost morose feel. He is a character in turmoil, and you can feel it with every word spoken, every gesture made. One of my friends was talking to two actors during the intervals; they were evidently not as impressed with the play as I was. Not the acting I understood, the actual play. They questioned why Hamlet didn’t just shoot his uncle when he had the chance. Well, for one, it would have led to a very short play, and two, just how easy is it to pull a trigger on someone? Let’s not forget, Hamlet was not a soldier, he had been at university when his father died, he was a scholar and therefore the act of killing someone in cold blood was not to be taken too lightly. Then there is the question of his sanity. Was he sane enough to come to such a reason? If we try to psychoanalyse Hamlet, as Freud’s friend Ernest Jones did, that famous indecision is due to a psychological blockage, or the Oedipus complex, whereby Oedipus prophesised that he would kill his father and become the object of his mother’s affections instead. The difficulty with Hamlet is that his Uncle has already killed his father and become the object of his mother’s love. This has confused matters, how can Hamlet do what Claudius has already done? As Jones argued, it would be like Hamlet killing himself. As to the rest of the cast, they lived in the shadow of Scott’s performance. The change of the play’s tempo suited some of the actors more than others. Gertrude and Claudius acted like teenagers in love, sneaking off and falling asleep on a sofa, entwined in other’s embrace only to be woken by an ambassador’s visit. This reminds us that this is no ordinary family; this is a royal dynasty where a public front should be shown at all times. I enjoyed parts of Jessica Brown Findlay’s portrayal of Ophelia. She gave the character some much needed depth; you truly begin to believe how much she hates life and herself. As she heads towards madness, she appears on stage in a wheelchair, rigid, hard, staring at nothing. In this play she doesn’t dreamily strew flowers about with gay abandon, this is a woman who has hit rock bottom. She despises herself, she lashes out and hits herself, and she hates what life has brought her. When Gertrude softly announces Ophelia’s death later, it is no surprise. Her prior entrance had showed she was not far from suicide. entertainment, and that is what the theatre is for…entertainment.